Factory Aprilia rider Francisco Lopez claimed his first stage win of the 2011 Dakar to consolidate his third position in the overall standings. The Chilean rider stared the day in sixth position and despite the dust was able to catch and pass his rivals to win the stage by 2m 21s. Second place went to Cyril Despres onboard his factory KTM who as a result closed to within 7m 24s of race leader Marc Coma who finished the stage in third place. Despres said: "Today was one of the best days of motocross-type racing of my entire life. Not only was it a beautiful stage, it was also a fantastic one to ride - a really great day, even in terms of results." Coma was less enthusiastic and descried the day as nice, but demanding. He said: "I suffered in the first part, because I was behind Ruben Faria and I was getting a lot of his dust; it was hard to pass. 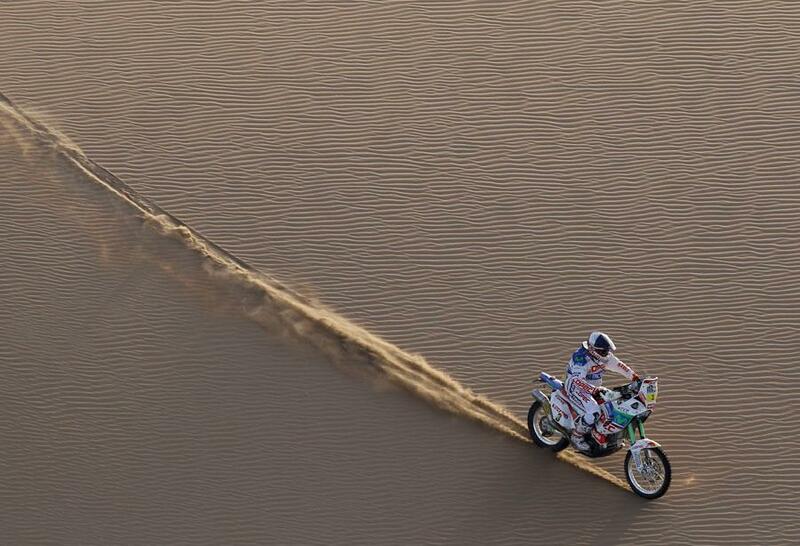 But in the last part, the sand dunes, I could ride at my own pace,"